Well, not exactly but quite a few people have been let go due to the budget cuts. The station's parent company, NBC Universal, said that it planned to reduce its news operations by at least 5 %, cutting 300 people nationwide. The staff reductions are part of a bigger NBC effort - referred to as "NBC 2.0" by the company - to save some $750 million by cutting employees in many areas. 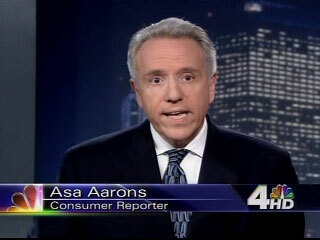 Locally the "NBC 2.0" cuts claimed Joe Avellar, Dr. Max Gomez, Jane Hanson and now Asa Aarons. I guess NBC wants to focus more on shows which are cheaper to produce, things such as reality shows. LAME! Jane Hanson been with NBC 4 since 1979? SEE YA! Joe Avellar? YEAH, YOU'RE DONE PAL. Asa Aarons? WELCOME TO THE CLUB! Where are they now? Naturally, most of them went to CBS. Dr. Max wasted no time signing on as a freelance medical reporter with CBS 2 News. Jane Hanson announced she was joining HealthAnswersTV as host of the video series "The Answered Patient". Uh, OK.
Joe Avellar has moved to CBS 880 News Radio. Asa was fired just last week and NBC will pay him through May. After that, he'll probably end up on CBS as well.